In a bank-dominated financial system, growth of the economy and banks goes hand in hand. Moreover, the growth of banking must be consistent with that of real sector. 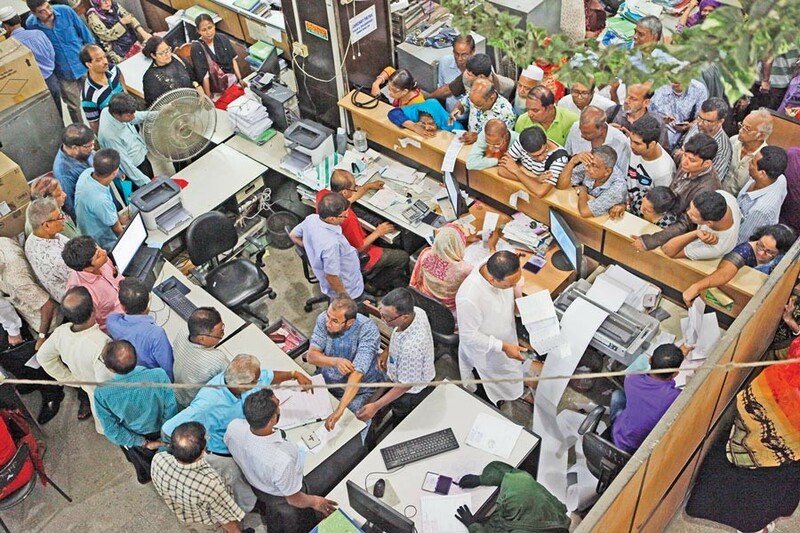 The pattern of banking development in Bangladesh, over the years, has been no exception to it. Current development objectives of Bangladesh (according to 7th Five Year Plan and Perspective Plan of Bangladesh) emphasise on sustainable and inclusive development, gender equity etc. and in line with those objectives, the present banking structure has also been reoriented. In fact, recent measures of Bangladesh Bank bear a clear-cut testimony in this respect. Like our previous practice, the Bangladesh Institute of Bank Management (BIBM) presents a brief review of structural and operational aspects of Bangladesh banking, based on our findings on annual review of seven (7) important aspects of banking, namely, credit operations, trade services, treasury activities internal control and compliance, information and communication technology, Islamic banking and human resources management. Credit operations: During 2017, bank credit growth was 18.66 per cent, 3.48 per cent higher than 2016. The highest credit growth was observed in industrial working capital category which was 26.64 per cent followed by 25.81 per cent in industrial term loan. In terms of distribution of credit according to economic purposes, the share of trade, as usual, was the highest having 34.38 per cent, followed by industrial working capital (21.59 per cent) and industrial term loan (18.69 per cent). However, the share of agriculture declined from 5.37 per cent in 2016 to 5.10 per cent in 2017. Public sector credit registered a negative growth of 9.3 per cent, whereas private sector credit growth was 18.1 per cent as against the target of 16.2 per cent. The overall credit deposit ratio of the banks (excluding specialised banks) reached 0.82 at the end of June 2017 as compared to 0.78 as of June 2016. Overall credit situation was observed to be improved in 2017 in respect of private sector credit growth, industrial and SME credit disbursement, credit concentration in large loan and trade finance. However, in spite of continuous Bangladesh Bank efforts of creating "hedge finance" environment, non-performing loan (NPL) situation, single client financing by multiple banks and overall credit governance (specially internal credit governance) did not improve in 2017. On the top, unearthing of some loan scams and imposition of loan and deposit rates by some private sector bank sponsors, bypassing central bank, would have no positive impact on credit situation, rather may aggravate overall banking environment. Trade services: In terms of trade payment and finance, the market share of PCBs remained very dominant in 2017. However, in connection with trade financing, the SCBs experienced notable growth in import financing, because of huge govt letters of credit (L/Cs) opening. As in the previous year, documentary credit remained the most prominent payment technique in both export and import transactions in 2017. Documentary collection remained the second most important trade payment tool in 2017. Out of different types of L/C, back to back and transferable L/C were used mostly, though the use of transferable L/C was observed to decline in 2017 as compared to 2016. In off-shore banking, the use of UPAS was the key component in asset side. Unlike 2016, PC appeared as the main component of pre-shipment finance in 2017. EDF facilities continued to attract the attention of traders. LTR was the key component of post shipment financing. Bank community was not able to remove or reduce the problem of poor drafting of L/C clauses and inappropriate use of incoterms. Correspondent banking relationship remained a critical factor for trade facilitation in 2017, though the impact of de-risking was reduced to some extent because of the efforts of some international development institutions. Unfortunately, credit risk and default loan scenario in trade services followed the same trend of overall NPL scenario of the country. Incidences of trade based money laundering continued as a growing concern for the policy-makers and the central bank because of lack of appropriate enforcement of available regulations. Treasury operations: The main function of treasury department is to manage fund of the bank optimally and profitably within the acceptable level of risk. In 2017, there was a big gap between deposit growth and credit growth in the banking system which reduces the surplus liquidity, as observed in 2016. However, money market remained liquid in the first three quarters of 2017. Liquidity was surplus in a few state-owned commercial banks (SCBs), as their AD ratio was only 55 per cent. AD ratio increased significantly in 2017, for some of the PCBs crossed even the permissible 85 per cent, because of high demand for credit from the private sector (excluding foreign borrowing of private sector). LCR and NSFR were also observed to be declining during 2017. Money market is still very narrow and corporate use of money market is totally absent. High import growth, declining remittance, and moderate export growth were the major features of foreign exchange market in 2017. A negative current account balance was one of the important reasons of depreciation of Taka. The volume of inter-bank spot, forward and swap transactions of forex market though increased in 2017, but in terms of size the forex market is still very shallow. On the whole, forex market was quite volatile in 2017. Offshore banking units (OBUs) were highly active in 2017. OBU exposure increased significantly because of lower interest in foreign currency loan. Bond market was also very shallow. Treasury bond secondary market was relatively less active in 2017. A major problem is that primary dealer (PD) banks do not provide two way quotations for Treasury bond. There are only 3 corporate bonds operating in the market. Apart from these, a number of banks have issued sub-ordinated bonds for raising capital and business fund. Internal control and compliance (ICC): A prerequisite of an effective banking supervision by the central bank is the existence of strong and independent ICC on the part of individual banks. Bangladesh Bank has issued a new guideline on ICC of banks in 2016. It is observed that policy frameworks of most of the banks have been revised and risk based internal audit have been introduced in accordance with the Bangladesh Bank guidelines. However no significant changes in the functional autonomy of ICC divisions have been observed. Though internal audit has become independent from management, but monitoring and compliance units of ICC divisions have become more dependent on management. In our survey on ICCD, most of the practitioners opine that lack of good intention of Board of Directors and senior management of the banks is the most important barrier to making an independent and strong ICCD. According to Bangladesh Bank assessment of ICC rating of different banks, only one bank secured "strong" rating, whereas more than 66 per cent banks got rating fair or marginal or unsatisfactory. This proves that overall quality of internal control system of the banks is not up to the mark. Information and communication technology: The BIBM review on IT operations of banks shows that around 96 per cent banks have introduced real time online banking, meeting category-1 architecture by the end of 2017. Along with PCBs and FCBs, 100 per cent branches of SCBs were also brought under centralised online banking system. Core banking software (CBS) plays a key role in online banking. However around 50 per cent banks are using foreign CBS. For a gradual shift from cash and paper based transactions to electronic modes of payment, BB has started BACH in 2010 having two components: ACPS and EFT. Internet banking has been permitted up to Tk 0.5 million. Mobile financial service (MFS) is another electronic platform. Agent banking has been introduced. Directives for e-commerce and m-commerce have been provided. New end user centric and real time payments such as NPS and RTGS have been introduced. These measures have significantly changed the financial services landscape of the country. At this moment, ATM services of 51 banks, POS services of 48 banks, and internet banking services of 6 banks are connected to NPSB. The number of ATM and POS are 9351 and 35,501 respectively. The number of debit card and credit card holders are around 11 and 1.0 million respectively. At present, 16 banks and one subsidiary are providing MFS. They have employed 0.7 million agents for providing this service. However, the market is overwhelmingly dominated by only 2 institutions. At present, the no. of MFS account holders is 56 million out of which around 30 million account holders transact regularly. New payment systems are also vulnerable to money laundering (ML) risk and banks should adopt risk-based approach that is, banks identify, assess and understand ML risks associated with the NPS and take appropriate mitigation measures in accordance with the level of risk. At the same time, awareness of both user and providers of payment services must be developed. Islamic banking: Islamic banks (IBs) have been operating in Bangladesh since 1983. As of December 2017, out of 57 banks, 8 PCBs operated as full-fledged Islamic banks and 16 conventional banks including three FCBs were involved in Islamic banking through branches and windows. In terms of deposits and credit (investment), the shares of Islamic banks are around 20 and 24 per cent respectively, having a bit higher growth than PCBs. IBs deposit structure is dominated by PLS modes, while investment structure is dominated by "mark-up" modes. This mismatch is a great challenge for IBs. However, practitioners and Shariah Committee members defend this situation as the entrepreneurs are unwilling to accept PLS mode and moreover honesty and integrity of the entrepreneurs are questionable. IB stakeholders demand a different legal framework for smooth operation of Islamic banking. Maintaining a capable and independent Shariah Committee/Council with adequate knowledge, and expertise is a critical need for banks. Islamic banks of the country also face difficulties in liquidity management due to the underdeveloped nature of money market. Moreover for improving efficiency of the Islamic banking services in the country, there are huge scopes of using internationally recognised Islamic banking standards like AAOFI and IFSB's standards. Apart from this, well trained personnel in the area of Shariah audit is another critical need of the industry. Human resource management: BIBM review on HRM observes no standard manual for employee recruitment and selection, compensation and benefits, job hierarchy and evaluation, training and development, leadership succession plan, transfer and promotion, practice of HRIS etc. in most of the banks. It is also observed that bank officials work long beyond their office hours causing work-life imbalances. BB has also asked the banks to strictly adhere to office hour. In this regard, top management attitude and mind set should be changed and they must create an enabling environment so that work life balance can properly be maintained. BB can take an initiative to issue guidelines to strengthen human resource operations of the banks. BB might have a separate cell for HR monitoring and supervision. Sustainable banking is the area where the achievement of Bangladesh banking system in the recent years is remarkable. The present level of practicing SB in Bangladesh is definitely going to have considerable positive impact on achieving SDGs by Bangladesh. Sustainable banking comprises green banking, inclusive banking and CSR activities of banks. The most remarkable step of BB on the way to promoting and implementing green banking is the issuance of "Policy Guidelines for Green Banking" in February 2011. In 2017, BB has redesigned the guideline on ERM and renamed it "Environmental and Social Risk Management Guideline", covering both social and environmental risk issues in bank investment. Moreover, BB introduced a separate department, "Sustainable Finance Department" to ensure proper initiatives in attaining government goal of SDGs. In terms of financial inclusion, the National Financial Inclusion Strategy has been prepared under the leadership of Bangladesh Bank. AFI policy award was given to BB. One exclusive department named Financial Inclusion Department was created by BB in 2015 to achieve the objectives of financial inclusion. In spite of all these achievements, the challenges of Bangladesh banking system, as mentioned earlier, is no less significant. In order to establish a robust, sustainable and resilient banking system, what we need is a noticeable improvement in banking governance specially internal banking governance and strengthening of supervisory and regulatory grip of the Bangladesh Bank. This article is an edited version of the inaugural keynote paper presented at the Annual Banking Conference organised by the Bangladesh Institute of Bank Management (BIBM) recently. Dr. Toufic Ahmad Choudhury is the director general of BIBM.